UNITED NATIONS, May 14 -- "Ensuring that the pirates are treated in an appropriate manner is right at the forefront of our operations," Rear Admiral Peter Hudson of EUNAVFOR Operation Atalanta told the Press on Friday. Inner City Press asked about the Russian Navy's reported killing of ten pirates, either by casting them to sea without their navigation equipment or outright execution. "I can't comment on that," Hudson said. The forefront. The very forefront. 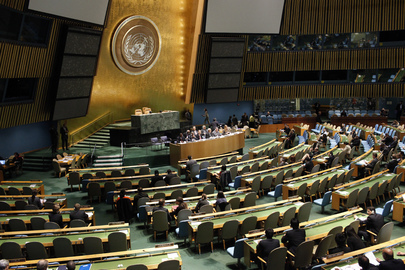 Hudson was among the few interesting speakers in a daylong "debate" on piracy in the UN General Assembly. 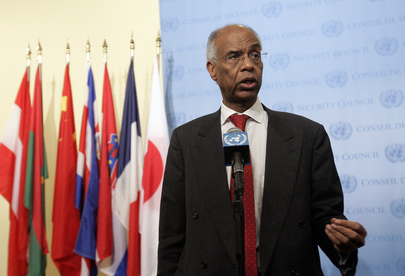 Ahmedou Ould Abdullah, moderating the second panel, refused to let member states like Cape Verde speak, insisting that those on the podium proceed with their speeches and Powerpoint presentations -- Mr. Endo's barely legible from the hall, did include a little cartoon pirate. 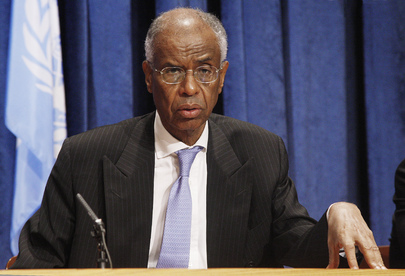 The speakers from the Somali Transitional Federal Government and African Union tied the piracy issue to illegal fishing in Somali waters. Inner City Press asked Hudson about this, and about the dumping of toxic waste on Somali shores. Hudson was dismissive, saying there is very little fishing of any kind without two hundred miles of Somalia. He scoffed at any relations between illegal fishing and the seizing of oil tankers for ransom. Video here, from Minute 8:18. But back in the GA hall, no member states was able to question Hudson on this. As usual with UN "debates," there were a series of prepared statements being read out, the lists between the podium and floor getting out of sink so that no one was responding to what had just been said. There was preening about pirates, a three-quarters empty GA hall filled with angry delegates denied until too late their right to preen. Watch this site. Update of 5:47 p.m. - as the six o'clock show down looms, the Netherlands bragged about a decision in The Hague, and Mona Juul of Norway -- which though not an EU member has a ship under EU command -- talked about the Contact Group. As neighboring Yemen began, its representative was told to be brief, the meeting was almost over. And the other speakers? Update of 5:58 p.m. - the moderator says his list includes, among others, Liberia, Tunisia, Sri Lanka, Spain (on behalf of the European Union), Greece, Syria, Korea, Thailand, Swaziland, Singapore, Argentina, India, Philippines and Lebanon. But he said while Liberia -- the "last speaker" -- has the floor, the other countries should think if they need to speak. Update of 6:06 p.m. -- he's doing it, the moderator, saying no interpretation after 6:10, so it's going to end. One hears: who owns this organization? Update of 6:09 p.m. -- the Ambassador of Khazakstan takes the floor, to read Ali Treki's final remarks. Sri Lanka walks out. The Philippines representative demands the floor, and says that it was very unfortunate many countries were not allowed to speak. The Philippines has many sailors in pirates' captivity. The UN Webcast is no longer working. This is off the clock. Update of 6:16 p.m. -- the Ambassador of Kazakstan gavels the meeting to a close. "Have a nice weekend," she says. Without translation.